On February 11th, tens of thousands of citizens took to the cold streets in over 200 cities across Europe in opposition to ACTA, expressing their support for internet freedom and digital rights. In what has so far been the largest protest against copyright legislation ever, it is clear that the concerns raised by civil society organisations, campaigners, and citizens are based on facts and can no longer be ignored. It has become clear to the European Commission and the Parliament that citizens will not stand idly by while important decisions about the future of our internet, our freedoms, and our rights are made without our approval. In the European Parliament, more concerns for ACTA are being heard: On Monday, the Greens staged an anti-ACTA demo in Strasbourg, and President of the European Parliament, Martin Schulz (S&D), among many other Members of the EP, has publicly expressed his concerns with ACTA, saying, "The necessary balance between the two - protection of copyright on the one hand and fundamental rights of [Internet] users on the other – is very poorly enshrined in this treaty." And sagely pointing out that, "It was a mistake to put counterfeit goods and copyright enforcement in the digital environment together in the same agreement." The European Commissioner for Justice, Fundamental Rights and Citizenship, Viviane Reding, has also released a statement that takes into account many of the concerns of civil society, supporting “the intention of several members of the European Parliament to ask the European Court of Justice for a legal opinion to clarify that the ACTA agreement cannot limit freedom of expression and freedom of the Internet”. The European Commission (EC), which tends to stand firmly together on all matters (including ACTA) may now be second guessing its stance on the controversial Agreement. European Commissioner for Trade, Karel De Gucht, has been leading the Commission in negotiations, and according to a recent meeting of the heads of cabinet, was moved by the protests that swept Europe on February 11. De Gucht’s representatives announced at that meeting, that a referral to the European Court of Justice (ECJ) is currently being considered. What could a referral to the ECJ mean for the fight against ACTA? While civil society groups, and many political parties in the EP, such as the Greens/EFA, ostensibly supported a referral to the high court, particularly to test it against its impact on fundamental rights, this was, from Access’ perspective, seen best as a second option to the final vote in the European Parliament (scheduled for sometime in June or July of this year). On referring ACTA to the ECJ, there are a few things to consider. Firstly, due to the Commission’s handling of this dossier so far, this move could be seen as a delay tactic intended to quell the anti-ACTA movement, since ECJ opinions can take up to two years. If indeed it is, the EC should know that this will only ignite greater public outcry against the Agreement. Secondly, the questions asked to the ECJ must be well-framed. Since the opinion of the Court is key in European decision making (particularly in influencing the upcoming vote in the European Parliament), supporting a referral to the ECJ should be provided only on the condition that questions are framed comprehensively, as a vaguely and ill worded question could result in an equally vague ruling. The question(s) will likely relate to whether ACTA is incompatible with primary (the treaties establishing the European Union) and secondary (legal instruments based on the Treaties) European law. Currently the EU has a number of pieces of legislation that are being overhauled and updated, most notably the review of the Intellectual Property Enforcement Directive (IPRED) and the upcoming IPREDII. Many key elements of the directive which relate to fundamental rights, such as access to user data, are also included in ACTA. By ratifying ACTA, the Commission and the Parliament will not be able to undertake any major reforms of this important Directive. It would also be encouraging non-European countries to implement these measures, which would have exponentially worse implications on fundamental rights. Indeed, if the Commission decides to properly address the risks to fundamental rights that ACTA presents, they could and should conduct an impact assessment on the potential of impacts of the Agreement, while they wait for the ECJ to render an opinion. By taking ACTA off the fast track, it would also allow other “partner” countries to evaluate the harmful implications of this agreement. Whether the referral comes from the Commission or from the European Parliament, this analysis is more or less the same. How will the ECJ rule on ACTA? It is difficult to say. However, in related news, the ECJ has today ruled again in favour of fundamental rights and an open internet. Similar to the Scarlet/SABAM case, SABAM -- a large Belgian rightsholder association (like the MPAA) -- brought the social network Netlog to court over their failure to comply with an injunction requiring the installation of filtering systems aimed at the prevention of infringements committed by Belgian members on its website (approximately 2 million consumers). The European Court of Justice ruled that a social network, “cannot be obliged to install a general filtering system, covering all its users, in order to prevent the unlawful use of musical and audio-visual work”. More details (including an FAQ) from EDRi here. This makes two recent cases where the ECJ has stood firmly on the side of fundamental rights, and could be a good indicator of what the court might say about ACTA if it is in fact referred. However, it is hard to know what the outcome will be. 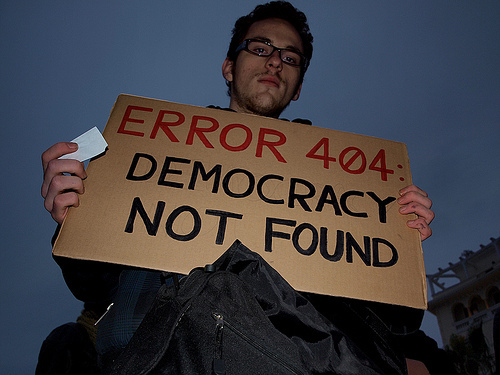 This is why it’s important for European citizens to stand strong and united against ACTA! * For more detailed information about what makes ACTA so controversial, see our booklet (translated in 13 languages), and our blog posts (here and here). To take action, visit the ACTA Action Centre and sign our global petition, which we’ll deliver to the European Parliament ahead of the final vote in July!